Rich in natural resources and extending over more than 13,000 islands, Indonesia today is in the midst of a period of great development. Sadly, this economic advantage does not benefit the entire population. Many children continue to live in unsanitary conditions and so do not enjoy all of their rights. Despite a recent economic boom, one third of the population continues to live below the poverty line. This country, divided into 13,000 islands, has not succeeded in improving the living conditions of all its families. 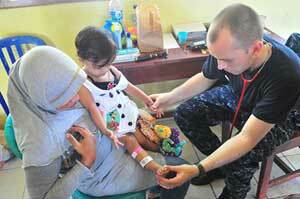 Therefore, many children living on the remote islands have very limited access to food, water and healthcare. Indonesia is faced with numerous problems related to health. For instance, the data on the child mortality rate are catastrophic: roughly 40% of Indonesian children die before the age of 5. Newborns, for another example, are the victims of multiple diseases such as low weight that are very common in this country. This issue recurs fairly often, as thousands of children are the victims of violence each year. This can take on multiple forms: sexual, psychological or physical. The sexual exploitation of children, especially young girls, is very common. Often forced to prostitute themselves in order to pay back debts, this last group of children is subjected to traumatizing types of violence. In addition, since Indonesia is known for its sexual tourism, many young women believe they will meet a Westerner that will offer them lots of money and a better life in exchange for their services. Indonesian law grants free education to everyone. However, this law has not been applied in all the provinces. 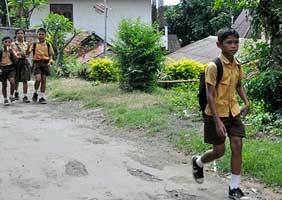 A large number of Indonesian children do attend primary school. An estimated 85% are enrolled in school. This encouraging number should still be improved upon, so that all children benefit from the right to education, no matter their place in society. However, an alarming number of these children do not continue on to the secondary level. The need to earn money becomes a higher priority than education. The children most affected by this lack of education are those from poor families, and even more particularly girls, who are often destined to become homemakers. 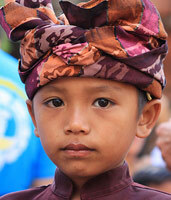 An estimated 7,500 children live in the Jakarta metropolitan area. This number alone is shocking and disconcerting, and even more so when one considers then just how many children may be affected by this problem over the entire Indonesian territory. These children, who often leave their homes after experiencing domestic violence, sexual abuse or poverty, find themselves left to their own devices in the streets. They must find a way to get money and food in order to survive in these unsanitary conditions. Welcome centers have been put in place to receive them. At the same time, these are insufficient for the number of children roaming the streets. 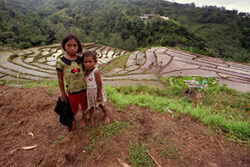 Child labour, in Indonesia, takes on many forms: domestics, workers in rice paddies, agricultural day-laborers, etc. Most of them are recruited from the streets and don’t have any other way to earn money, so they submit to their own basic needs. Indonesian law fixes 16 as the minimum age for marriage for young girls and 19 for boys, since the legislation states that persons younger than 18 are children. Young girls that marry before they are 18 years old are considered legal adults. Consequently, the traditions survive, mainly in remote and underprivileged regions where many girls marry very young. Around 20% of young girls marry before they turn 18. This is dangerous, since they do not understand the consequences of marriage on their individual lives. Indonesian citizenship is acquired from parents or by birth within the territory. In addition, it is necessary to be registered with the authorities in order to be recognized as an Indonesian citizen. This is flawed in Indonesia, since registration of births is not free. To that end, many parents with limited income do not follow these procedures, without realizing that this will have serious consequences for their children. It is estimated that more than half of Indonesian children are not registered. These children will have difficulties benefiting from their right to both for children and adults.